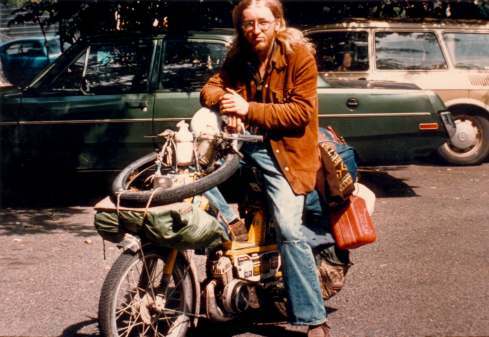 In the summer of 1978 I (Walter Muma) undertook a 3-month 11,500-mile (18,660 km) journey by moped from Toronto (Ontario, Canada) to Yukon (Canada), Alaska (USA), and up the Dempster Highway to Inuvik, NWT (Canada), and back to Toronto. This was the longest journey ever made on a true unmodified moped, until 2007. For more information on my attempt to claim my trip with Guinness World records as the longest moped trip (prior to Denieulle's trip), please see A World Record. This trip is now featured on Wikipedia! This website contains a complete travelogue of this trip, with over 300 photographs and a description of the trip, plus technical information about the moped and details of the trip. Clear Channel radio, Ohio - Feb 14, 2005; 25 minutes.